Gold effort: Taryn Gollshewsky in action representing Australia. 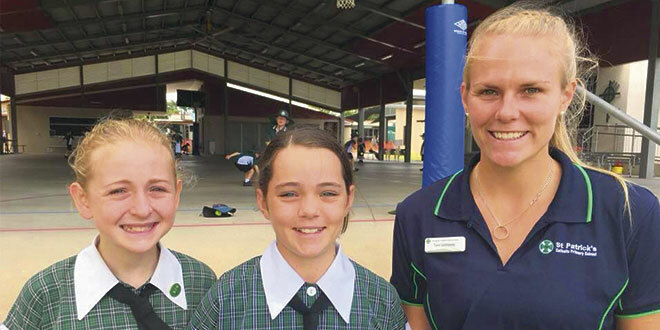 TARYN Gollshewsky can count on the cheers of every child at Bundaberg’s St Patrick’s Primary School when she steps into the discus thrower’s circle at the Gold Coast Commonwealth Games. “Miss G”, as her students affectionately know her, is a first-year physical eduation teacher at St Patrick’s. Throughout first term she balanced a gruelling training schedule with her full-time teaching. “Currently I have fourteen-hour days,” the 24-year-old said. She wakes at 4.30am and heads straight for the gym. She then comes home, walks her dog, has breakfast and heads to school. After school at 3.30pm, she heads to the gym for another few hours training. “It’s an exhausting schedule to maintain, however, I love both my athletics career and my teaching career and I juggle them as best I can,” Ms Gollshewsky said. A talented athlete as a youngster, she has always had the Games in her sights. Ms Gollshewsky made her first Wide Bay sports team at age 10, became a national champion when she was 13 and even made the state volleyball team only a few months after a teacher encouraged her to try the sport. “The children love having a Commonwealth Games athlete at their school,” she said. “They wish me well and luck nearly every day. “They ask me questions about the village and training and how far I can throw. Even in the Games village, Ms Gollshewsky expects to spend some of her time thinking about St Patrick’s: “So I can prepare and plan for Term 2,” she said. Ms Gollshewsky will compete in the discus heats on Tuesday (April 10). The women’s final is on Thursday (April 12). Games hope: Taryn Gollshewsky with students Elizabeth Pascoe (left) and Lucy Hamilton, from St Patrick’s Primary School, Bundaberg. Previous: What will be discussed at Australia’s plenary council?